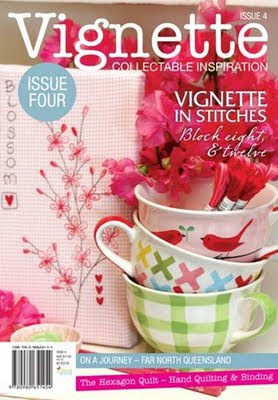 It is so lovely, full of recipes and sewing inspirations..
like the hexagon quilt, Vignette in Stitches quilt. fast efficient and great prices, Vicki gets the goods delivered. Overseas customers are welcomed too. so get in quick...before they run out. You also can also get back issues too. as well as all the other projects to do too. Back tomorrow with a surprise present that was bit late. 13 days and counting!!!! Lol, I Love Leanne's magazine too - such a talented designer ... and writer! Hope all is well in the city of churches! This is my Song...what's yours?? ?